Sanchong-eup, Sancheong-gun, Monday 9 September, 10am. At the Institute, the chief researcher Dr Kim Yun-geun shows me round the various laboratories. It’s one of those scenarios where the guide has only a few words of English, the subject is extremely specialist and so Kyung-sook, who I discover later has been press-ganged into delivering the presentation to the World Health Organisation, and who is neither a biologist nor a professional interpreter – rather an artist – naturally struggles to translate for me what I am being told. I see people sitting at PCs: office life seems to be much the same everywhere. But these are scientists writing up their research results rather than clerks processing emails and spreadsheets. I see lots of machines which to the uneducated eye would be just as much at home in an espresso bar as in a hi-tech laboratory. I see laboratories with test tubes, petridishes and microscopes. I see a giant walk-in safe in which samples and cultures are kept chilled or frozen. I see a room which will be put into use once the Institute gets a licence from the government to act as a standard-certification body for herbal medicine. None of it is making much sense, though I can see that this is place where serious scientific work is done. On the way out I see, on the wall, blown-up abstracts from academic articles. All the articles, the results of research and experiment at the institute, have been written by one or more of the scientists at the Institute. 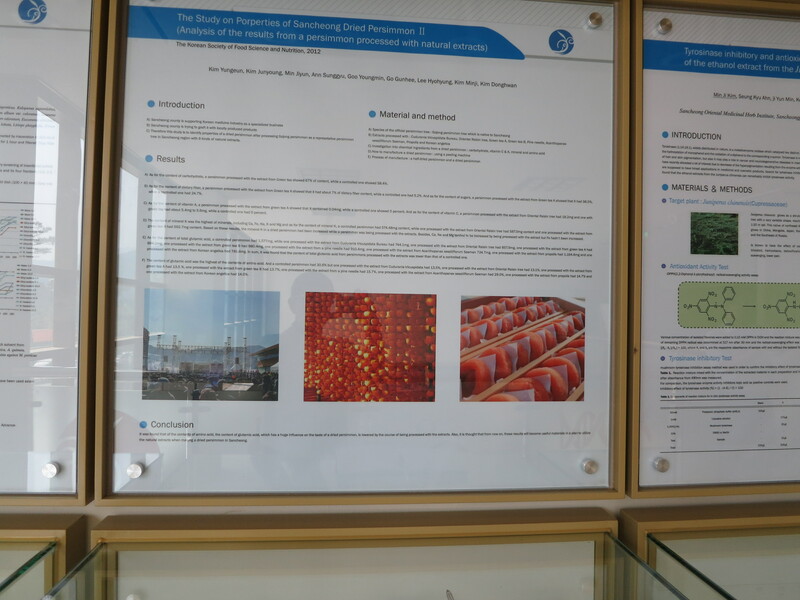 Titles such as “Insecticidal activity of oriental medicine plants against Myzus persicae (green peach aphid)” and “Study on the Properties of Sancheong Dried Persimmon (analysis of the results from a persimmon processed with natural extracts)” serve as examples of the area of research: organic pest control, analysing the nutritional benefits of certain products. Sancheong County is located in the region of Jirisan – a mountain of great spiritual significance for Koreans and which in 1967 was the first national park to be designated by the Korean government. The county is blessed with natural resources and is known for keeping ancient mysteries intact. The clean water and the vital force (gi) of the land on the slopes of Jirisan are the optimal conditions for growing medicinal herbs. More than 1,000 native species of such herbs can currently be found growing in the region. 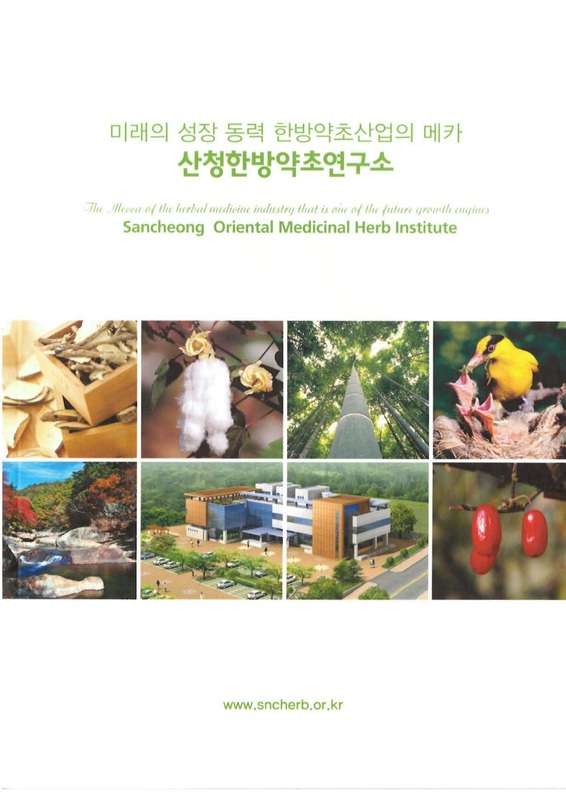 Coupled with its long association with medicinal herbs, Sancheong is also the birthplace of the Donguibogam, the UNESCO-listed medical encyclopaedia published in 1613. Building on this heritage, the Sancheong Oriental Medicinal Herb Institute was founded in 2009 to provide technical, scientific and academic support to Korea’s medicinal herb businesses, to enhance their quality and to provide specialist know-how, ensuring that Sancheong’s long reputation for excellence is continued well into the future. And while looking to the future with advanced research and technology, their philosophy is rooted in Jirisan’s medicinal heritage. 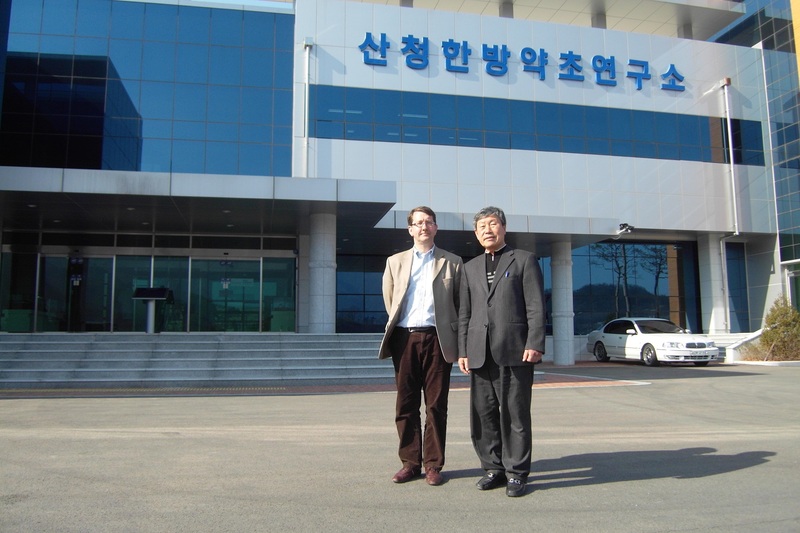 Part of the Institute’s role is to introduce standardisation to Sancheong’s, and indeed Korea’s, medicinal herb industries, bringing the latest developments in research and technology, and supporting smaller businesses by providing a central resource of specialist equipment which is too expensive for small-sized companies to purchase. The Institute also conducts its own specialist research. Its priority area of applied research is into adult lifestyle-related conditions. Other areas of research are the different medicinal herbs growing on Jirisan (as part of which they are establishing a material bank) and comparing the efficacy of medications prepared in different ways – benchmarking contemporary techniques against those set out in the Donguibogam, and often discovering that the old ways are just as good or even better than the new. The institute collaborates with university research departments, bridging the gap between academia and industry, enabling businesses to benefit from the latest developments. At the end of my stay in Sancheong I would provide them with text along those lines. And a year later I would be presented with their revised brochure, which more or less disregarded all the changes I had suggested. Had I known in advance, I would have been less stressed about the whole exercise. But in any event, at least the mental effort I put in enabled me to understand a little bit more about the county of which I am goodwill ambassador. On leaving the Institute, we set off to Sancheong town to do battle with phone companies. Evergreen Mobile tells you1 that your SIM can be easily topped up online, via an app, or at any branch of a well-known convenience store. Well, it’s impossible to register on their website, their app doesn’t work, and when you visit any branch of that well-known convenience store (whether in Sancheong or, as I was later to discover, in Seoul) they have no clue what you’re talking about. So, as the company rents their bandwidth from Olleh KT, we go to a KT store to try to credit my SIM card. No luck. We are directed to the local head office of KT where we queue up, talk to the people behind the counter, get on the phone to another office, and again reach a dead end. It seems that the only way I can top up my SIM card is to open a Korean bank account and make a direct credit to Evergreen from there. I’m getting thoroughly hacked off with the whole process and with Korea in general for making things so impossible. But then something changes. The lady behind the counter is on the phone to another office. She calls up something on her screen. Kyung-sook tells me to hand over 50,000. I do so casually, with one hand, still fuming at the complications. I should have been more polite, using two hands. For I later discover that the lady behind the counter had just topped up my SIM at KT head office using funds from her own bank account. Thank you.